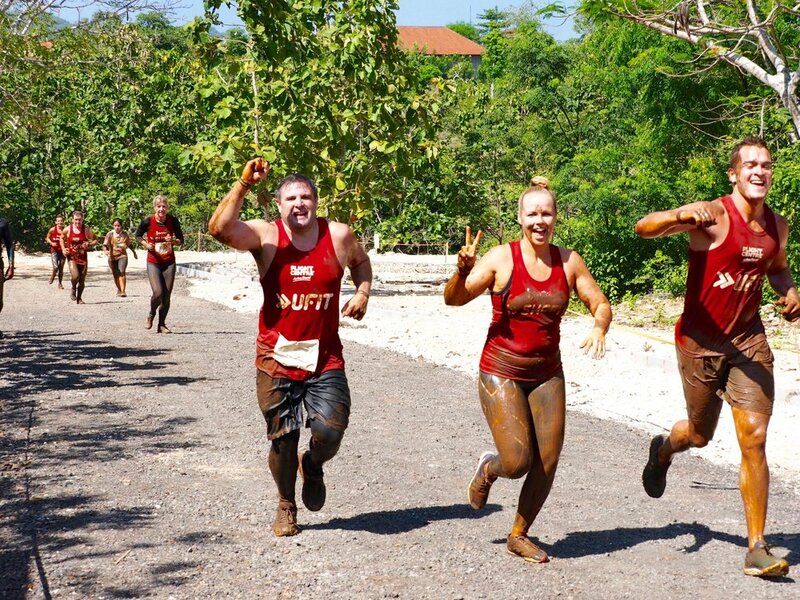 Mud, mud, glorious mud - UFIT take on Tough Mudder Bali by storm! The UFIT team represented the little red dot in force at the start of October. We wore our red tees in style and as a team of over 35 we flew to Jimbaran to take on what Tough Mudder describes themselves as the 'toughest event on the planet! This was Asia's first experience of Tough Mudder and UFIT was proudly representing Singapore as an official training partner of the team event. We spent a few months preparing with our especially designed obstacle sessions every Sunday as well as UFIT Bootcamp sessions including HIITFIT, RUNFIT, Fit Max and Fit Elite to help get us prepared and build our team spirit. We used our awesome facilities in the jungle at CrossFit Bukit Timah which has all the important equipment to work on our skills, strength and endurance. Time flew by and before we knew it we were off to take on the event itself! Pre race nerves were kicking in that we actually had to complete 21km. Much to some of our team’s relief we were only doing 13km as a result of the extreme heat at 8am. Others wanted to complete the 21km and hopefully next year we’ll be able to come back bigger and stronger to complete the full course. We were instantly faced with mud and expected nothing less. Plunging into mud pits sliding around, to climbing walls, crawling, and then lying backwards in a cage with a small gap for our faces to poke out to breathe. The obstacles are certainly testing for those with fears. The beauty of this event is that you have your team mates by your side every step of the way to help give that important leg up and keep the team spirit buzzing, laughing and encouraging all of the way. It was that cold - great shot of Wendy Riddell in action. Alison and I were both excited and nervous ahead of the inaugural Tough Mudder in Bali, Indonesia. UFIT was an awesome partner in this event, providing specific weekly training leading up to the race, organising accommodation, not to forget the post race dinner and drinks. Event itself was well run, perhaps a little disappointing that the course and obstacles were reduced with no notice. The camaraderie from the whole of the UFIT Team during the race was superb. Everyone played their part in helping each other conquer obstacles (Nathan & Declan perhaps more than others) sticking as a group when running in between them and given moral support when needed. Can’t wait to do it all again in 2017!! Bring on the next challenges we face and let's smash them together. At UFIT, together we're fitter, leaner, stronger. Not only are running events in Singapore extremely popular in recent years, but we've seen a significant increase in obstacle events take to our shores. UFIT has created specific training sessions to help teams prepare not only for the endurance and strength elements of these races but also the technical parts including rope climbs, monkey bars, crawls, tyre flips and drags to sandbag carrying. Held at our awesome outdoor location at CrossFit Bukit Timah we run these every Sunday at 8:15am to beat the heat and get race ready. Challenge yourself and get prepared with UFIT. Find out more information here. Here's a collection of our awesome Team UFIT weekend away! Now that you’ve kick started your endurance training its time to tackle the all important strength training. Let’s face it, if you don’t build your strength you will struggle with the obstacles. UFIT are an official training partner for Tough Mudder Bali 2016" and "Go to www.toughmudder.id for more information on the first Tough Mudder in Asia. Our Obstacle challenge expert has put together a training plan to get you ready for the mud pit in October. No matter how good of a runner you are, if you don´t have the strength and skill to conquer the obstacles you will have a very long day. But don´t worry. You still have plenty of time to get your body strong enough to be successful on the event day. Luckily for you this is a team work event so we can work together to get over those obstacles, give your team mates a helping hand to be a valuable member of the team. The obstacles are usually very varied, but there are some basics that you will need to train. That includes gripping, core, pulling, pushing, lifting and carrying. By training for these strengths and skills you will be able to conquer most obstacles. Luckily this will also build full body strength for everyday life. So how do you train for this? We will start with a variety of compound movement such as deadlifts, squats, pull ups and presses. This will be combined with conditioning such as crawling, heavy carries and burpees. Turn your training up to the next level by including strongman training such as prowler work and tyre flips. The closer we get to race day the more explosive work will be added so you can fly up that two-meter wall. You will need a strong grip for the funky monkey 2.0, rope climb, backstabber and more. (If you don´t know what some of these obstacles are check out Tough Mudder’s website.) To build a strong grip you need to be hanging from things and holding on to things such as barbells, kettlebells and ropes. Remember that there are different types of grip strength. The most common type that you will use is the closed hand grip. However, also having a strong open hand and pinching grip will make it easier on e.g. a monkey bar with a thick grip or a wall climb. This means that you have to train the different types of grip by using thicker bars, hanging from your fingers etc. Train your grip every time that you are in the gym or have access to a bar to hang from. By just doing deadlifts or Pull ups will train the grip, but doing dedicated grip work is a good idea. You can start by hanging from a bar for 30 seconds and do that for three sets. Next time increase the time to 35 seconds. And finally, don´t be lazy! Carry those plates with a pinch grip instead of rolling them to your bar. If you are using heavy deadlifts and squats in your training you are getting plenty of core work. These two exercises activate the different core muscles more than any other specific core exercise. If you also include some bear crawls and hollow rocks, you can skip those boring planks. Watch your form on deadlifts and seek a Personal Trainers guidance to ensure you’re executing correctly to prevent any injuries ahead of the event. You will need a lot of pulling strength in obstacle challenges. Monkey bars, rope climbs, wall climbs and pulling on a rope with a 30kg weight attached to the other end are just a few of the obstacles that will require a strong pull. That means doing pull ups with as many different grip variations that you can think of. And don´t forget to include rows as well to build strength in all angles. There are not as many obstacles that require pushing, but there are some. The last obstacle challenge I did I had to lift a heavy keg and lift it up on a platform over my head. The pushing will also balance out all the pulling work. Vary what you are pushing or pressing. Use barbells, dumbbells, kettlebells and sandbags. Press overhead and in front of your body. Use your legs or press strict. Again if some of these exercises are completely new to you always ensure you’re getting the best advice and support as you don’t want to be reduced to injury. Lifting heavy objects off the ground is a common thing in an obstacle course. It can be a rock, a water filled keg or a sandbag. You also want to build a strong posterior chain (lower back, glutes and hamstrings) to be explosive up over a wall or running up a warped wall such as the” Everest” obstacle. Build this strength by doing deadlifts. You can vary the deadlifts by changing the grip and height that you are lifting from. If you have access to a trap bar or an atlas stone, you can use those as well. After picking up that heavy object you normally have to carry it a certain distance, sometimes over rough terrain. Practice this in training by doing carries of different uncomfortable objects over different distances. Farmers walks and plate carries over shorter distances or a longer run with a sandbag or a rock are great ways to practice this. Once you have built that basic strength you will need to build explosive power. If you have access to a Personal Trainer with knowledge in the Olympic lifts, then using power cleans and power snatches are excellent ways to build explosive power. Also incorporate plyometric in your training such as jumping off a box and exploding off the ground as fast as possible. You will need to follow a more structured program to build your strength, but I also like to add some form of circuit training to build strength under fatigue just as you will we doing during your race. This is where I like putting the strongman work at least once a week. If you start using these tips and follow the running program that I gave you in the last article you should be getting ready for that Tough Mudder in no time. To help you a bit more and to inspire you see our sample 6-week program. These are the crucial six weeks leading up to the more explosive focused weeks leading up to your obstacle challenge. If you are unsure of any of the exercises, please ask your training buddies or a Personal Trainer to make sure you’re executing correctly and using the right weights. If you don´t have access to some of the equipment needed, then just use replace with something similar. If you’re reading this and based in Singapore, then UFIT will be your saving grace. We’re running specific training sessions as of 21st August every Sunday with Daniel Lundberg to home in on your skills. Otherwise our training grounds at Amoy Street, One-North, UFIT Bootcamps, CrossFit Tanjong Pagar and CrossFit Bukit Timah will be your saviour as we can accommodate with all equipment. Get using your imagination and teaming up with your obstacle buddies to add the FUN factor into your training. Above is a sample program that can be adapted to your level of fitness, the important thing is that you get consistency in your training. Good luck, have fun and hit the gym! At UFIT, we exist to inspire and guide our community of members to realise levels of fitness and confidence beyond what could be possible by themselves. Fitness isn’t our job; it is our way of life. This is our promise – to provide experienced, results-driven coaching that goes the extra-mile to help our members achieve their greatest transformation. Join our community. Together, we have the power to change. At UFIT we provide a number of different services to suit your fitness goals from Personal Training, UFIT Bootcamps, CrossFit at our two boxes Tanjong Pagar and Bukit Timah as well as helping you recover and rehabilitate mind & body through the likes of meditation and physiotherapy at the UFIT Clinic. Daniel Lundberg is UFIT’s CrossFit Bukit Timah Coach. Daniel still actively competes in obstacle challenges and triathlon and the occasional CrossFit competition at an amateur level. He believes in setting measurable goals and working towards those. That goal can be a specific obstacle challenge, reaching a specific weight or lifting a certain weight on the bar. Whatever that goal may be hard work and commitment is what will be required.